Less than 24 hours after the horrific van attack, the people of Barcelona set out to reclaim their beloved city. 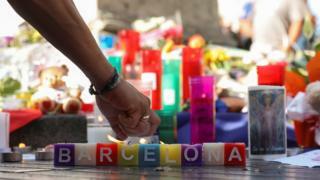 Under the watchful eyes of heavily armed police, they streamed around the centre on foot, strolling up and down the re-opened boulevards of the Ramblas. Only the clusters of people standing around little vigils of candles here and there, and the camera tripods of the media, broke the flow. Stop at a tree where a little stuffed toy had been placed amon g the candles and flowers, and you could make out the sound of several women crying inconsolably as a man with a guitar led others in a rendition of John Lennon's song of peace and tolerance, Imagine. To hear such weeping, you would wonder how anyone could put on a brave face but, each in their own way, people have been pushing back at the horror of Thursday's events. She will not let me publish her name but she tells me everything else, this mother of four from a town near Barcelona. How she heard of the attack while enjoying a day out on a French beach to the north with friends, the alerts pinging on their phones. "We all have kids and we are always walking around PlaÃ§a de Catalunya (Barcelona's main square) and the Ramblas, so it could have been any of us," she said. On Friday she cut flowers from her own garden and, as public transport was disrupted, she set out on a slow, hot journey into the city to lay them on the Ramblas. On the central square, she stood in the crowd, near the staff spilling out of the Apple Store, as people observed a minute's silence at noon. They applauded King Felipe a nd Spanish and Catalan political leaders who had set aside their political differences to turn out together in an extraordinary show of solidarity with the victims. "We are all human beings," she said. "This has nothing to do with Catalan independence or friction. This is a terrorist attack and we are defending peace. This could have happened to you, to me, to my children, to anyone." Why did they attack Barcelona, I asked. "Because Barcelona is always in the papers," she said. "When you're a terrorist, no-one will pay attention if you attack a little village lost in the middle of nowhere, yes? But attack Barcelona and everyone is going to read about it." Then we said goodbye and she headed off to the city's Vall d'Hebron hospital to give blood. Human rights activists Luca Gervasoni A vila and Josep Maria Royo also turned up to observe the silence. "We are all in shock," said Luca. "It was not easy to come here, just 100 metres from the place where the attack started." For him, the key message was that "we have no fear and we are a city of peace". While this was a moment for giving support to the victims, there had to be a rethink on how to combat terrorism, he said. Mass surveillance and intensive use of the military and the police did not work, he argued. Instead, "human rights, tolerance and democracy" should be promoted. "We are a city with a large number of i mmigrants, a city that wants to welcome refugees, a city that wants to offer a different model of response in the event of terrorism," said Luca. "Now is a moment to think different." Josep Maria Royo's immediate response to the violence in Barcelona was to go on social media in an effort to calm people down. "People were sharing images of their crime which showed children, blood, injured people," he said. "It's easy to spread a message of hate against the Islamic population. We must stop these expressions of hate."